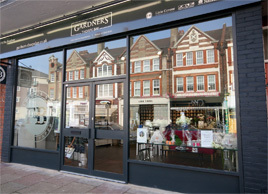 Situated the region's most design-forward shop, Gardners Leigh On Sea delivers an exceptional shopping experience . Our team know their stuff and can assist you with colour, interior design, and will help you select the paints and wallpapers you want to make your home just the way you want it. With over 4000 litres of Designers paints in stock and ready to go, and over 1200 wallpaper designs at your finger tips Gardners really is the place to go when you want to see everything in one place. Visit or call us on 01702 474569.